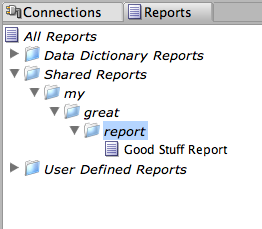 The next step to having all these great reports in xml files would be to organize them. This one is the simplest by far. The name of the folder is split on the / and sub folders are made. This is very handy when a report gets into 100s of lines of xml since the reports can now be stored in multiple files but foldered together in the tool. Like in sqldev the "Data Dictionary Reports -> Database Administration -> Sessions -> Session Reports" report which allows kill/trace sessions is over 500 lines by itself and in a separate file.